There are some things that just naturally go well together. Like strawberries and chocolate, bread and butter, Kim and Kayne…ok, well you get the picture. The pairing of peanut butter and chocolate is just one of those matches that we all enjoy. 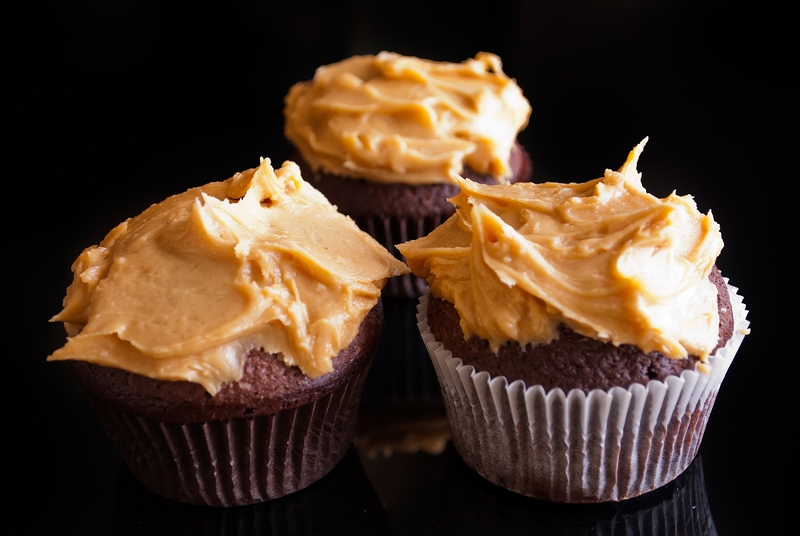 Whether it’s our Single Serve Peanut Butter Cup Coffee or this recipe for Peanut Butter Cupcakes from GimmeSomeOven.com, it’s a combination that can’t be beat. So let’s heat up the oven and get baking these divine cupcakes from GimmieSomeOven.com. Preheat the oven to 375 degrees F. Place baking liners into baking cups and add a peanut butter cup in each one. This recipe makes enough for 24. Add cream, butter, and sugar into bowl and mix until light and fluffy. Add in one egg and beat well, and do the same with the next egg. Pour in the vanilla. Wisk together flour, cocoa, baking soda, and salt in a medium-sized bowl and whisk well. You’ll need one more bowl, where you stir the buttermilk and coffee together. Alternate adding the dry ingredients with the creamed butter mixture along with the buttermilk and coffee and be sure to beat the mix well. Grab those prepared baking cups and fill them with batter, over the peanut butter cups. Only fill them up until they are 2/3 full. Place in the oven and bake for 15 to 20 minutes or until done. Run your index finger through the empty bowl of mix and enjoy. You’ve earned it! While the cupcakes are baking, you can now make the frosting. In a bowl, mix the peanut butter, butter, and vanilla with a beater on medium until smooth. Add in the remaining ingredients and beat on a low speed until well mixed. You want the frosty to be nice and fluffy so increase the speed back to medium until fluffy and delicious-looking. You may want to taste test just small amount just in case. Just because. When the cupcakes are done, let them cool on the oven’s wire racks for 10 minutes before removing. Add the peanut butter frosting. And, of course, taste test one. Why not? You did all of the work! Why shouldn’t you enjoy it first? Share a photo of your amazing cupcake baking skills our Facebook page or just share your favorite recipe that you enjoy with a cup of Grande Kaffe coffee!